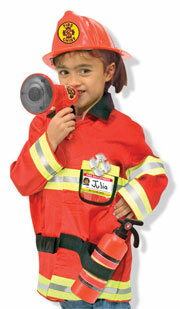 The Melissa & Doug Fire Chief Role Play Costume Set allows your child to dress up like a heroic firefighter. Suitable for ages three to six, this costume set contains everything your little one needs to pretend they’re a fire chief, including a bright red jacket, helmet, fire extinguisher, bullhorn with sound effects, badge, and name tag for personalizing. With its colorful design and quality construction, the Fire Chief Costume Set is sure to inspire your child’s imagination and have them ready to save the day in an emergency. Durable jacket is machine washable. View larger. The Fire Chief Costume Set comes with everything your little firefighter needs. The bright red jacket is trimmed with yellow highlights and reflective silver material, just like a real firefighter’s, with Velcro seals on the inner front flaps and built-in utility belt. Adorning the sides of the belt are two straps for securing the fire extinguisher and bullhorn. A shiny badge and name tag for personalization add to the colorful flair. The bullhorn makes realistic siren sound effects (requires two AA batteries, not included). Bullhorn makes sound effects! View larger. Capping off the set is a fire chief helmet with fire department emblem on the front. Accounting for the various sized heads that may wear it, the helmet comes with a detachable size adjustment ring on the inside, ensuring that your little fire chief will have a comfortable fit. 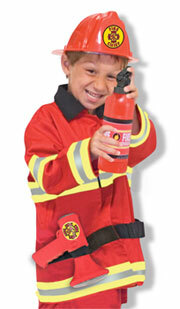 The Fire Chief Costume Set features quality construction for durable play. The jacket is constructed of 80 percent polyester and 20 percent cotton and is machine washable for easy care. 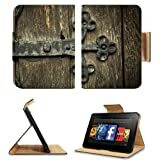 All accessories are formed of sturdy yet lightweight plastic. Our testers found the accessories and construction of the Fire Chief Costume Set to be of high quality. The detailing on the jacket and helmet contribute an authentic look, while the fire extinguisher and bullhorn make for fun, simple play. The adjustable ring on the inside of the helmet is a particularly welcome touch, making it easy for children of different sizes to wear the helmet snugly. Started in the garage of Doug’s parents’ house in 1988, Melissa & Doug has become one of the most popular toy makers in the world. Its toys have garnered dozens of awards and have been widely featured in national media. Melissa & Doug toys meet all US consumer product safety regulations. The toys are tested at the factory of origin during various phases of the production process to ensure they meet the company’s stringent safety requirements. In particular, the paints and coatings on Melissa & Doug toys are tested frequently to meet or exceed government recommendations limiting heavy metals and lead in children’s items. Firefighter jacket, helmet, badge, fire extinguisher, bullhorn, and name tag. What are miracles? Why do miracles happen? Do miracles still happen? The subject of miraculous activity is one that has compelled believers for millennia. This book describes and recounts some of the most fascinating stories that have taken place not on the dusty pages of some centuries-old manuscript, but here and now in our own modern world. Fr. Paul Glynn, a Marist priest, takes the reader on a trip around the world to the sites of miraculous happenings, including healings, apparitions and conversions, including Lourdes, Knock, and Fatima. Through personal accounts and meticulous studies, he is able to show solid evidence and proof of God’s work in our lives. These inspiring stories will enhance the reader’s faith as well as provide a bastion of comfort for those in doubt. Illustrated with many photos. Concerto The Big Church of Fire no Bacalhoeiro – 11/01/2013 https://www.facebook.com/thebigchurchoffire http://bacalhoeiro.blogspot.pt. Massive fire at the First Baptist Church of Oak Park.